The future is here. 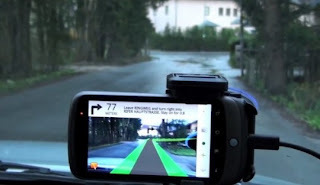 In the past week I have stumped upon a video that show the next generation GPS; a real live navigation on roads and through streets as it projected to an actual picture on phone. I know, it doesn't really make sense until you see the video. The technology is already available on Android and the iPhone (although a lot longer for the Android) and it uses our actual world to "paint" over it. The surroundings are sampled by the camera, GPS, compass and phone's internal gyroscope. The results are mind blowing; GPS that highlights the actual road and other cool stuff hat will be presented in future posts.